Christian Veggietales Characters Now Called Racist – Coercion Code – "Dark Times are upon us"
Ryan Duncan reports that Veggietales is back. For many Christians my age, VeggieTales is a childhood staple. I was only six years old when Bob the Tomato and Larry the Cucumber got their first installment, but I still remember it like it was yesterday. The title was Where’s God When I’m S-Scared, it starred Junior Asparagus and Frankencelery (who was really just an actor named Phil Winklestein from Toledo), and featured that lovable song, Everybody’s Got A Water Buffalo! It been years since that first video worked its way into the hearts of children everywhere, and now, after countless Bible stories and any number of silly-songs, VeggieTales is being renovated. 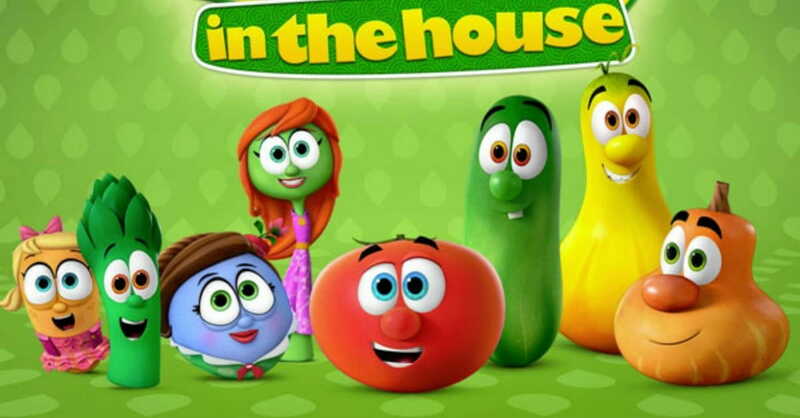 It’s a bold and, frankly, much-needed step for the animated series, but what will Christian audiences think of the new VeggieTales in the House? First, let’s get some technical stuff out of the way. The new series is coming to audiences via Netflix, thanks to DreamWorks Animated Television. All the familiar vegetables have been given a substantial visual upgrade, but still retain a similar designs (though, in some cases, not the same voice actors). The new animation is pretty sharp, and it makes the episodes pop like never before. Fans of the old videos might find this a little jarring at first, but overall, the new cartoon is a significant improvement. Story wise, Bob and Larry’s familiar countertop has been expanded to an entire kitchen where all the characters work and play. Once you get past the somewhat obnoxious new theme song, viewers are introduced to a quaint little town where all the episodes take place. Given that this is a Netflix series, the new stories are understandably more condensed than their predecessors, but they still deliver plenty of fun in their short time. The real change however, is in the show’s tone. Past instalments of VeggieTales occasionally had jokes for their adult viewers, never anything objectionable, just something for parents to laugh at. Sadly, VeggieTales in the House is geared completely toward children which, while not a bad thing, may leave some older fans feeling disappointed. This is all certainly interesting, but the question most Christian viewers will be asking is undoubtedly, “Where is God?”. With so many changes happening as VeggieTales transitions to Netflix, is God’s love still the cornerstone of the beloved animated series? The answer is a tentative “yes”. Of the two episodes I’ve viewed, God and His word have ended up being the heart of the story’s message. An episodes about responsibility titled“Puppies & Guppies” ended with a Bible verse from the Book of Luke, and its follow-up entry, “Pie Fight!”, closed with the show’s familiar catchphrase (God made you special, and He loves you very much). For the moment, VeggieTales in the House appears to be a strong step forward for the classic Christian franchise. There are ample amounts of silly songs, family-friendly stories, and Biblical lessons for kids to relish. The gang’s still all here (maybe they grew a mustache but they’re still all here), and God remains the center of each new video. Change can be a tough obstacle for any series, but VeggieTales has handled it admirably. We can only hope that these new instalments touch the hearts of children like they did so long ago. But the characters are made to feel a little embarrassed by a ‘whiteness Forum’ held in California, that is suggesting the characters are racist. Foxnews reports a group of students at a California college’s “Annual Whiteness Forum” labeled the Christian children’s cartoon “VeggieTales” as “dangerous” and promoting racial stereotypes for making the villains colored. “When supremacists aim to taint the way children think of people of color, it will work,” the poster titled “Children in the Church” reads. The female student who headed up the project reportedly said the evil characters sound ethnic or Latino, while the good characters sound white. Just to be clear, the good guys, Bob and Larry, are red and green respectively, both of which are colors. But there is not one cauliflower character among?